I am helping FAO, CAB International, and the National Agricultural Library (USDA) integrate their three thesauri -- AGROVOC, CAB Thesaurus, and NAL Thesaurus -- into a new Global Agricultural Concept Scheme (GACS). In order to present users with a thematic overview of its contents, we looked back to a classification scheme that was developed jointly by the GACS partners almost two decades ago, briefly applied in 1999 to the CAB Thesaurus, then dropped. The Web has evolved alot since then, making it technically much easier to collaborate on maintaining such a classification today. 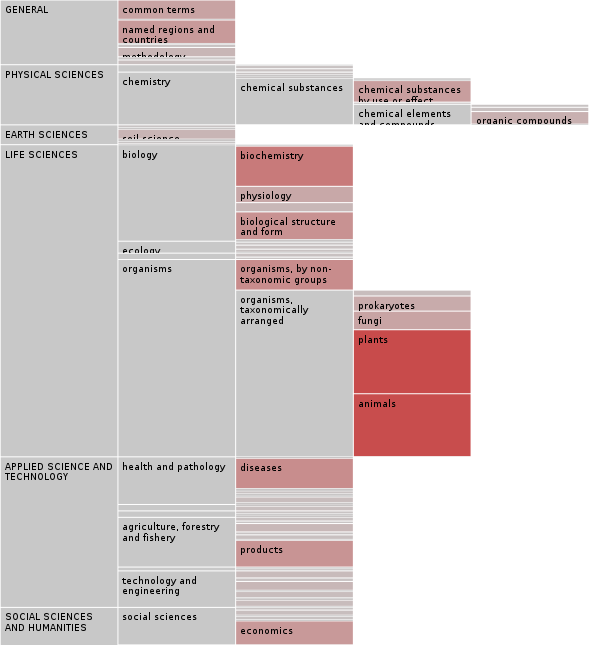 The thematic structure from 1999 has six top-level classes: General, Physical Sciences, Earth Sciences, Life Sciences, Applied Science and Technology, and Social Sciences and Humanities. To prepare GACS Beta 1.2, I was able to extract class information for 82% of the concepts in GACS from text files provided by CABI. We will classify the remaining 2,750 concepts manually. The full structure of 145 thematic classes is visualized below. Classes shaded dark red hold the most concepts, the biggest being "plants" and "animals" with about 1,250 concepts each. The hierarchy is at most five levels deep (for chemicals). The distribution of concepts throughout the thematic structure is quite even; no class has a disproportionately high number of concepts. As in the 1999 CAB Classified Thesaurus, each class has a two-letter notation code which makes the classes fall into a natural order when sorted alphabetically. These thematic groups should work well for GACS, and it is nice that they can build on the results of cooperation between the same three organizations from the 1990s. You can explore this thematic structure online in the Skosmos concept browser, bearing in mind that GACS is still in beta. We anticipate an official roll-out in the new year.